As someone who has been wearing prescription glasses for several years now, I can tell you firsthand that they make a big difference when it comes to your overall look. There are so many shapes, colors, and styles out there, and whether or not you need a prescription, glasses are a great way to change up your style. I recently discovered Warby Parker, which sells chic and trendy glasses and sunglasses with and without prescription lenses. Like TOMS, they use the buy-one-give-one model, so every purchase helps get prescription eyeglasses to communities in need. 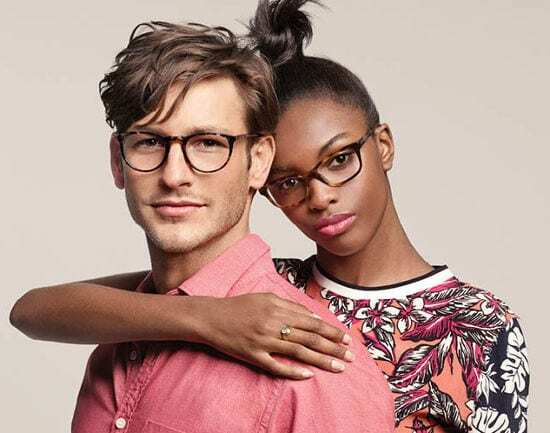 Warby Parker also does lots of fun collaborations, including current ones with model Karlie Kloss and the founders of the website Into the Gloss. These “Mitchell” glasses from Warby Parker have a professional and authoritative look, so I thought they’d be perfect for a polished office outfit. A checkered blue pencil skirt adds a dose of fun color and print, while a white sleeveless blouse will keep you cool in the hot summer months. 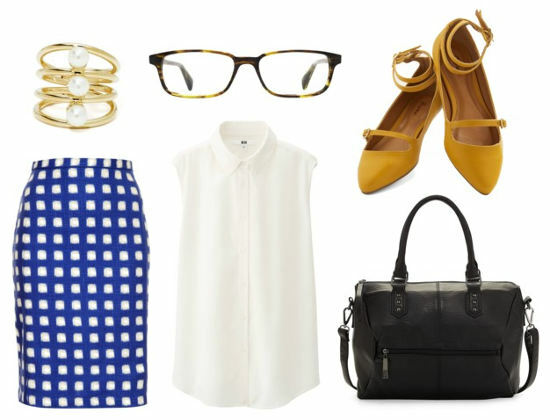 Mustard yellow ankle-strap flats add another fun and colorful touch, but are still work-appropriate. A simple black handbag and pearl ring add the sophisticated finishing touches to the ensemble. Ah, Fridays! 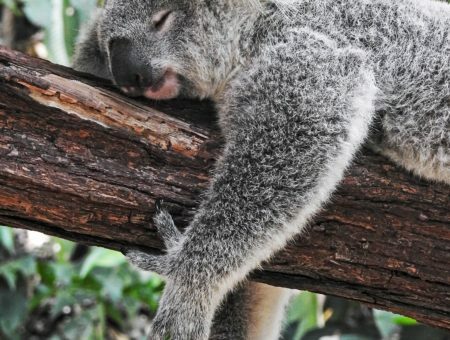 The day when you want to just kick back and get ready for the weekend, and probably don’t feel like getting too dressed-up. This outfit is perfect for those lazy summer afternoons – just grab a summery striped tank and white cut-off shorts, paired with your favorite casual sandals. A braided bracelet adds just a bit of sparkle, while a slightly messy ponytail keeps the look easy and effortless. Warby Parker’s “Duval” glasses polish off the ensemble with a cool-but-slightly-nerdy touch. I have to be honest – this is probably my ideal outfit. Simple, comfy, and cute, but still enough to catch someone’s eye. All you need are some distressed boyfriend jeans, a lightweight mint-hued sweater, and pale pink tasseled loafers. Accessorize with a floral infinity scarf and Warby Parker’s trendy “Haskell” glasses. This look is perfect for running weekend errands, going to class, or for those slightly-cooler summer days. Do you change up your look with trendy glasses? Have you tried Warby Parker? Which look is your favorite? Let us know in the comments!